Back in April of 2001, Adobe released their first version of Photoshop Elements to target casual photographers. A little over three years later, in September of 2004, they released the first edition of Premiere Elements for the casual videographer market. These products were made to complement Adobe's existing lineup of highly regarded applications -- of which, those being full versions of both Photoshop and Premiere both widely used at the time. However, there has always been a deterrent for some users who only needed basic tools, and did not require such things as fancy filters, high resolution photo editing, and intense video editing along with a huge array of effects. The high price point is a major turn off to many people, as it was quite a steep cost to pay for just basic photo or video editing that a novice would need. Don't get us wrong -- many enthusiasts and professionals embrace Photoshop and Premiere Pro, and to them, it's worth every penny. With the introduction of the Adobe Element series, which comes at a fraction of the cost, there was a lot more interest in the whole lineup of Adobe products for both novices and enthusiasts alike. That's not to mention that for Photoshop and Premiere Elements, there are also plug-ins that can add more functionality to the software, which definitely will draw some enthusiast photographers and videographers on a budget. Today, we will be taking a look at both Adobe's Photoshop Elements 8 and Premier Elements 8 -- the latter is actually just the 6th edition, but to match the numbering scheme, starting from version 5 it was renamed version 7, haha. We'll see if Adobe's latest entry into the casual user market can justify the upgrade, or even attract new customers to purchase the newest version of the Elements series from them! Just as I began to gear up for my holidays after all my exams, the FedEx man came by with a package for me. At first, I had no clue what the package was, not until I too enthusiastically opened the package and quickly noticed my mistake of forgetting to take the opening photograph. Inside the package was Adobe's Photoshop Elements 8 and Premiere Elements 8 that we have arranged for this article. It was shipped in from Adobe's main office in California, USA using FedEx International Priority as the shipping method (Adobe used such a fast shipping method that I was caught off guard when it arrived so quickly). The corrugated cardboard box came in very good condition, save for the inevitable bumps on the corners of the box. 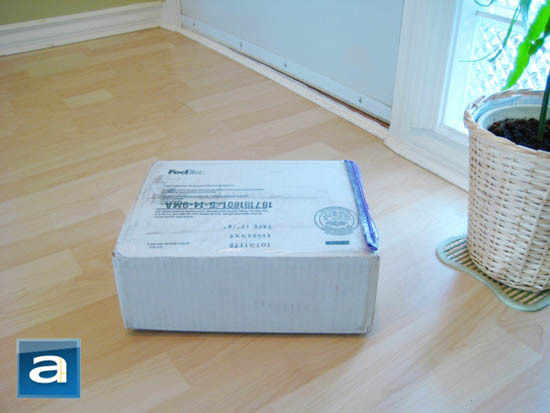 A first-class job by FedEx in delivering the package to us, as usual. Our retail version of the Adobe Photoshop Elements 8 and Premiere Elements 8 bundle came in a single retail box, carefully packed with shipping paper placed on top to keep the retail package from moving around inside the white corrugated cardboard box. The retail packaging came in pristine condition, and had no damage that was visible to the naked eye. 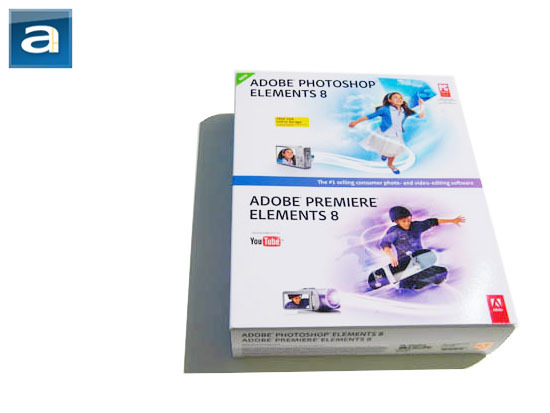 The retail packaging of Adobe's Photoshop and Premiere Elements 8 uses the same box design that Adobe has used for a while -- a white background is complemented by a line through the middle of the box separating the area for Photoshop Elements and Premiere Elements, respectively. Images were also used to represent each of the respective products. This is nothing new in particular, but various pictures have been updated for the new version. Of course, the digital camera and camcorder remained, which has been used since the first version of Adobe Premiere Elements came out. Opening the box reveals the various instruction manuals, in addition to the DVD bookshelf case containing a single Adobe Photoshop Elements 8 and Premiere Elements 8 DVD. Long gone are the days of jewel cases made of fragile clear plastic. All the material included out of the box carries on the same consistent design theme, with the DVD case cover actually being identical to the retail box look. 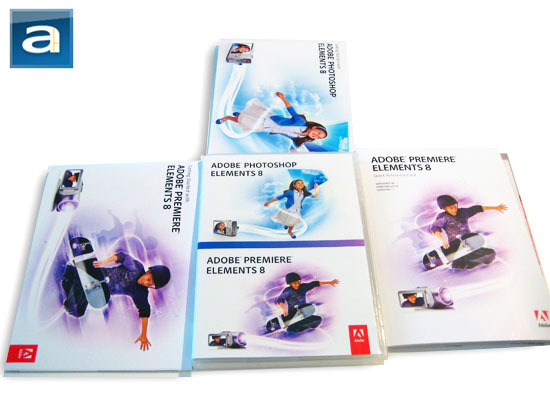 The instruction manual for Photoshop Elements has the picture for Photoshop Elements as shown at the front of the package, and the same applies for Premiere Elements and its instructional guides.